Fans and journalistsalike have peggedInfinite Undiscoveryas an attempt by the stagnating JRPG genre to jumpstart itself with new ideas and make a grand entrance onto the next-gen stage. Well, we appreciate the gesture, but Infinite Undiscovery really only goes halfway. 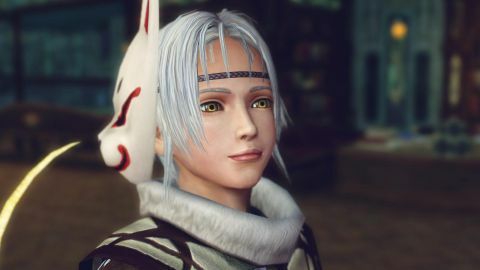 Despite a few glimpses of greatness, all the novel gameplay ideas fall flat, the visuals aren’t always as pretty as the screenshots would have you believe, and above all else, there’s the feeling that you’re playing just another JRPG. Infinite Undiscovery’s not a bad game, but it’s got a laundry list of problems that make it nowhere near the sea change we were hoping it would be. The story follows the grand destiny of Capell, a whiny flute player with a J-pop hairdo who - because of his uncanny resemblance to the world’s greatest rebel hero, Sigmund - gets thrown into prison. He’s rescued by Aya, the prettiest member of Sigmund’s rebel forces, and inevitably gets caught up in Sigmund’s great quest to liberate the world from an evil empire called The Order, which has chained the moon to the world for some mysterious (and no doubt nefarious) reason. It’s a compelling tale with a few twists, but it gets a little strung out, with only small morsels of character development doled out here and there amidst the “go from town to town completing superficial objectives” game structure. Capell’s the archetypal reluctant hero who starts off whiny and apathetic, but eventually matures into a real mensch. Thanks to some nice voice work and an exquisitely detailed character model, though, he’s convincing and extremely likable. Same goes for the vivacious Aya, a tough cookie of a princess whose romance with Capell is truly charming despite being a bit cookie-cutter. But therein lies one of the biggest problems with the game’s storytelling – the core characters are nicely rendered and portrayed, but the other dozen or so who are haphazardly thrown into the mix feel irrelevant and hollow. Which is a shame, really – aside from a few throwaways and rehashes of characters from developer tri-Ace’s past games, the character designs are interesting, and the characters themselves have personality to spare. The overpopulated cast isn’t just there for show, though – they play a big part in the game’s combat. This is one of Infinite Undiscovery’s supposed novelties: large-scale battles with multiple groups of party members. With up to a dozen characters onscreen at once, there’s a nice sense of grand scale and full-on battle frenzy. You’ll see the other squads battling it out on the other side of a dungeon, sometimes helping you, sometimes needing help. Only problem is, more characters onscreen means the game starts chugging along at a snail’s pace. And with all the spell effects and sound clips being tossed around, it quickly descends into slow-as-molasses chaos instead of stylish, epic anime warfare. Everything takes place in real time, with no separation between exploration and battles: encounter an enemy in the field, it attacks you (or you attack it first for a special advantage), and it all happens seamlessly. You control Capell directly, while your computer-controlled buddies can only be given general directives, like to save energy or fight freely. It’s a good system on paper, but it falls flat in execution. The Connect system feels like it’s built for stringing combos together between Capell’s attacks and whoever’s connected to him, but no matter how you time them, the moves never really flow into each other, and it just feels like a circus of random sword swings and people shouting silly things like “Diminuendo Dive!” Occasionally you’ll have to defend yourself, but the horribly awkward parry system requires some telepathic timing to block any hits, meaning that high-tailing it will be your number one defensive strategy. Between the broken blocking and the flashy-but-shallow Connect system, hack and slash ultimately becomes the order of the day. And that’s disappointing, considering tri-Ace has made some of the deepest battle systems in RPG history. As for the visuals, well, they’re spotty. That Square-Enix veneer of super-high production values shows in the game’s beautiful vistas, filled with ruins and monsters that conjure thoughts of what a next-gen Zelda could look like. There’s also some breathtaking architecture in the towns, plenty of eye-popping color and spell effects, and nicely detailed and animated characters. But there’s also the slowdown, a few notably ugly textures and plenty of bland settings and repetitive environments. Taken as a whole, Infinite Undiscovery’s a game with a bit of an identity crisis. When it’s acting like a run-of-the-mill JRPG, it feels clichéd, but reasonably enjoyable. When it tries to be innovative, however, its unsatisfying combat, superfluous subsystems and wasted ensemble cast make the whole experience feel half-hearted. Like its hero Capell, the game’s caught between sticking to what it knows and the temptation to go out and be a real revolutionary. Unfortunately, Infinite Undiscovery never really figures itself out, leaving it an inconsistent game that’s awkward and shallow, but still intriguing. Just like its nonsensical name. Description Uneven graphics and choppy combat against a great art style and intriguing story - this game's caught between sticking to what it knows and the temptation to go out and be a real revolutionary.